CLARINS Lotus Face Treatment Oil 100% pure plants extract Oily or Combination Skin 30ml, a facial oil for combination skin types or skin prone to oiliness. Made from 100% pure plant extracts the balancing face oil is a blend of Rosemary, Geranium and Lotus extracts, which purify the skin, tighten pores and refine skin texture. Hazelnut Oil softens, soothes and seals in moisture to prevent fine lines and moisture loss. A moisturiser for oily skin that nourishes and refines, leaving it feeling satin soft. Treatment Type: Detoxifying and Purifying Facial Oil. Clarins Face Treatment Oil Lotus Oily/Combination Skin 30ml / 1 fl.oz. 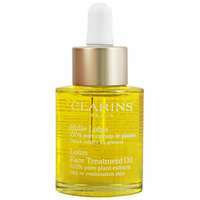 CLARINS Lotus Face Treatment Oil 100% pure plants extract Oily or Combination Skin 30ml was found on 4 websites and was price compared using EAN: 3380810112207. The cheapest CLARINS Lotus Face Treatment Oil 100% pure plants extract Oily or Combination Skin 30ml is shown as the main item, prices range from £31.48 to £34.00, excluding delivery. Price comparison based on price and delivery charges, with any valid discount codes being applied, is shown in the table above. Prices and information correct at the time of publication.